Where does it take place? 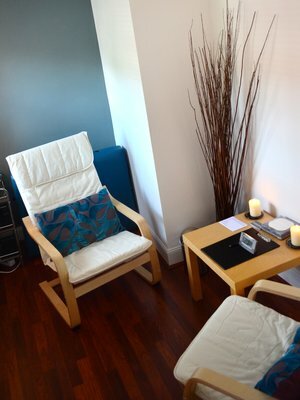 I work from a shared practice in Harborne - the Renaissance Therapy Centre. Sessions take place in a quiet, private room within a building set back from the road. I also offer skype counselling if you are not able to come in person. Do I have to come every week? In our first session we will discuss how frequently sessions will be. Some people find that fortnightly or monthly works better than weekly sessions, but this is something we can agree together. What if I have to cancel? If you give notice at least 48 hours in advance, there will be no charge. If you cancel later than this we will try to reschedule later that week. If this is not possible, you will still be charged for the missed session. When will therapy end? You have the right to end therapy whenever you feel the time is right. We will discuss this in our first few sessions and agree a time-frame that works for you. How much do you charge? My normal rate is £40 per face-to-face session, £35 per Skype session. If you will struggle financially to pay this, we can discuss concessionary rates. Is travel there difficult? Harborne is well-served by buses from the city centre as well as elsewhere, and the Renaissance Centre is a couple of minutes walk from the High Street stop. There is no parking within the Centre, however there is often on-street parking nearby, and there are two car parks in St John's Road by Sainsburys and 60 minute free parking at the High Street end of Station Road. Can I pay with health insurance? I am registered with Aviva and VitalityHealth. If you wish to pay using either of these please let me know beforehand.